It seems so basic, yet it has taken me a lifetime and then some to learn that to be in the here and now I have to get off ‘autopilot’ and engage my senses. I actually created a company to encourage it, yet still I forget to do it. My ADHD seems to have a mind of its own so I find it helps to create some tools that keep me present. When I find I am getting more and more distracted with my ADHD, I practice the art of engagement by engaging my senses. The five senses that I was born with, but often forget are there because my mind is on the fast track. The sense of smell, taste, touch, sound, and sight.This is especially helpful when I am feeling negative energy, because if I don’t do some type of soft interference I can lose my sense of being and am instead in my mind. Engaging one of my senses allows me to get back in the moment, and be present. Literally feel your feet touching the ground. Sense the energy in that touch, and allow it to travel up your body to your head. It gives you a very grounding sense of being here. Have something small on you, at all times, that is a color pleasing to your eyes and heart. Maybe it is a yellow key chain, or a red mouse pad. Perhaps you like the color blue, like the ocean, so you have a blue comb. When you look at that object, make the association of the color with the feeling to bring your focus into your body. Keep your favorite gum, mouth spray, or mint on hand. When you put it in your mouth don’t just habitually chew it, but focus on the sensations through your body as you enjoy the experience. Carry chapstick with your favorite scent. You can get chap ticks these days in all kinds of scents, and it does not have to be just for when your lips are chapped. If you find your mind going off in a tangent, smell the scent of the stick, really smell it. Allow your entire body to feel the effect of the scent. Create a play list of favorite tunes, and keep it on your phone, in your car, or on your computer. Even the most simple of phones have the ability to play songs these days – it’s amazing. If you feel the need to connect your body and mind to the present moment, press play and allow the song to reverberate through your being. We forget these simple things. We are in a hurry, we are running, or maybe we are even still but our mind is not. What we want is peace and engagement in THIS moment. Our body is equipped with a multitude of tools to help us get in that moment, we just need to remember to use them. 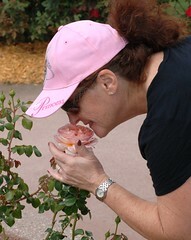 Do you have any favorite ways of engaging with your senses? Please share.